Share the post "SEBS Scientists to Help Create ”Songscape” for Mullica River-Great Bay Estuary"
Rutgers Tuckerton Marine Field Station Laboratory in Little Egg Harbor Township, New Jersey, will be the headquarters for singer-songwriter Ben Sollee when he comes to create a “songscape” for the Mullica River-Great Bay Estuary next month. Nick Romanenko, Rutgers University. Singer-songwriter Ben Sollee to visit estuary, compose original music. Scientists at the Rutgers University Marine Field Station will host singer-songwriter Ben Sollee for four days in April, while Sollee soaks up inspiration from the Mullica River-Great Bay estuary for an original music video. Sollee’s composition will be one of several organized by Sustain Music and Nature, which creates connections between musicians and nature organizations to draw attention to the work of both. They do this by placing artists like Sollee in public lands for several days, and recording on video and sound the music that they are inspired to produce. The resulting music videos are sold to support the artists’ and environmental groups’ work. Sollee said he uses his music to inspire change and to bring attention to environmental issues. His “Ditch the Van” tour featured him and his cello cycling between show venues. He’s given lectures on sustainability in the music industry at SXSW and TEDx in San Diego, and used his talents to call attention to mountaintop removal strip mining in Appalachia. His music has been heard on NBC’s Parenthood, HBO’s Weeds, and Killing Season, a film starring John Travolta and Robert De Niro. 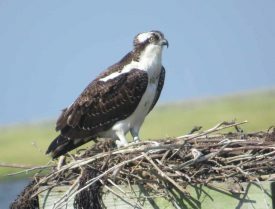 Osprey like this female sitting on her nest on Great Bay, will be common sights when Sollee visits in late April. Photo: Sing Lin. 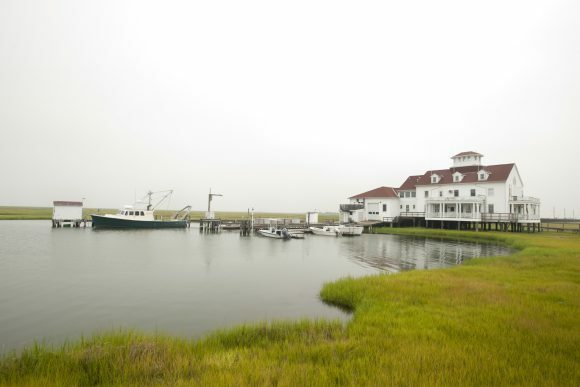 Sollee will spend four days in the estuary, from April 24 through April 27, and will be based at the Marine Field Station in Little Egg Harbor Township, New Jersey. 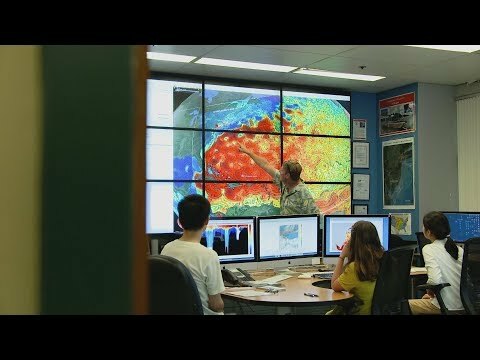 Ken Able, a professor of marine and coastal sciences and director of the station, and Roland Hagan, the station’s coordinator of operations, will show Sollee much of the estuary. During this retreat, Sollee will experience the Great Bay by kayak, research vessel and foot while birdwatching, engaging in marine research and seeing the effect of climate change and sea-level rise on coastal forests. Songscapes created under the auspices of Sustain Music and Nature include tributes to the Bear River Migratory Bird Refuge in Utah, the Seedskadee National Wildlife Refuge in Wyoming, the Great Mountain Forest in Connecticut and the Katahdin Woods and Waters National Monument in Maine.